The Mayan civilization is considered to be one of the most fascinating and influential ancient cultures in the world’s history. The Mayan culture flourished in the tropical rainforests of Central America in countries like Mexico, Guatemala, Belize, Honduras, & El Salvador. The Maya developed their first civilization in the preclassical period (2000–1000 BC). In Chiapas, Mexico settlements were established around 1800 BC in the Soconusco region of the Pacific coast. This culture reached its major development during 250- 750 AD. This period is characterized by large constructions and important development in arts and sciences. The decline of the Maya civilization and abandonment of Mayan cities occurred between the late 8th and 9th centuries. One reason for this decline was the Mayan political collapse: the cities were consequently abandoned and the dynasties ended. After the abandonment of the major cities Mayas settled near permanent water sources. Hundreds of years later when the Spaniards arrived to the new world they found the abandoned Mayan cities as remnants of this great civilization. The Mayas were conquered by Spaniards (who used gunpowder weapons not known in the new world) in the 16th century. Today, most of what is known about the Mayan Empire has been discovered in archaeological excavations, interpretations of hieroglyphics, and from descendants of the Mayas. The Mayan culture has attracted the attention of scholars due to its sophistication in arts, astronomy and engineering for their temple buildings. The Maya scientific heritage includes the development of a sophisticated number and calendar system. The Mayan calendar system allowed them to plot time for the next 400 million years and predict occurrences such as the movements of the planets and the eclipses of the sun and the moon. The Mayan Calendar includes 365.2420 days in terms of modern calendar days. The Mayan number system allowed them to make sums up into the millions and comprehend the concept of zero ahead of any other culture. Regarding religion, Mayas were polytheistic and had deities of all types, ages and both sexes. The artistic heritage is found in stone sculptures, Mayan murals, and jade preserved in altars and pyramids (temples). Today Chiapas in southern Mexico is the region with most Mayan archaeological remains such as Palenque (The center of the Maya Empire in Mexico), Toniná, Bonampak (located in the Lacandon Rainforest) and Chiapa de Corzo. Palenque, which means wooden palisade or fortified house, is one of the finest examples of Mayan art, architecture, and sculpture. It is located in northern Chiapas, in the heart of the Mayan rainforest. Bonampak which means painted wall is famous for its murals that are displayed in three chambers of a temple. These paintings are characterized by bright colours which are derived from minerals. These murals are important for understanding the Maya society. In the first chamber the painting depicts lavishly dressed priests, nobles (e.g. governor dressed in a jaguar skin) and musicians. The second chamber depicts a battle and prisoners. The murals in the third chamber depict dancers, an orchestra, and nobles being waited on by their servants. Though the Mayan empire does not exist any longer, there are Mayan descendants today who live in the tropical rainforest in Chiapas (Maya Biosphere Reserve). They hold ancient knowledge of nature, take care of their land, have inherited a great cultural wealth, and grow coffee in the rainforest under the shade of the tall trees. Today, the ancient Maya region in Chiapas is famous for producing one of the best Arabica coffees in the world. Arabica coffee from the Mayan region stands out due to its taste and aroma. This delicious taste is rooted in a combination of specific regional factors such as volcanic soils, altitude, humidity, the ecosystem, and rainfall. Chiapas Mayan rainforest is home to thousands of unique animals and plants, some of which cannot be found anywhere else in the world such as the quetzal, jaguar (panthera onca) and ocelot. The combination of all these unique factors contribute to the excellent quality of our Maya Elixir Chiapas Coffee of Mexico Real Cafe’s Collection which was awarded with 2 gold stars in the Superior Taste Award in Belgium in 2016. Want to try an exceptional coffee grown by descendants of the ancient and mystic Maya culture? 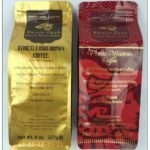 Then drink Maya Elixir Chiapas Coffee of Mexico Real Cafe’s collection: each sip will make you feel like you are at the core of the Mayan rainforest, home of wild animals where nature is blended with a mysterious and wise ancient culture. There are also many healthy reasons to drink coffee, so next time you want to stay healthy and have fun drink Mexico Real Coffee!! !